Spending time in the great outdoors alone or with family...there is nothing like the peace and tranquility that comes from getting away from it all. Whether you are taking a drive, hiking, having a picnic "off the beaten path" or overnight camping, portable toilets need to be packed in your vehicle, right next to the cooler (well...maybe not RIGHT next to it), for those times when nature calls! Let's be honest - we may not enjoy talking about the topic of portable toilets as a general rule, but whether we live in an urban or rural setting, are outdoorsy folks or city slickers, I think it is safe to assume we have one thing in common - we have all shared that panicked feeling that arises when we can't find a restroom! So let's jump in and have this discussion once and for all, so we can be better prepared next time. My husband and I are fortunate to live just a few miles away from beautiful Glacier National Park in Montana.Though we can never be sure about the weather when we're planning an outing (it can snow in June), we can always count on this fact - nature always calls when there is no outhouse in sight! In addition, no matter where you set up camp, it is not a fun trek to the outhouse in the middle of the night...and this is especially true in grizzly bear country, where we reside. All happy campers know that wise "potty planning" is essential for a successful outing. However, it can be overwhelming trying to sort through the vast number of commodes available today, in addition to researching performance quality. There are portable potties available these days to suit virtually every need! Choosing the wrong toilet in haste can lead to a very unhappy camper...and we all know HASTE MAKES WASTE (could not resist the pun, our apologies). We do believe you would rather spend your valuable time planning your trip instead of learning about a portable toilet...so Robin and Jim to the rescue! We rv full time and have plenty of time...so we constructed this article to help you find the right commode for your outing, quickly and easily. We've also listed some of the best potties and their accessories, to help you purchase with ease. One little toilet paper tip: no matter which toilet you choose, if you aren't using a garbage bag for contents, throw toilet paper in a ziplock bag for clean, easy disposal. If you are tall or have bad knees, you want to be sure to purchase a taller toilet. Some commodes sit very low or are less sturdy. Be sure that the item you choose is designed to hold your weight. For women, there is a whole line of affordable, portable female urinals...perfect for hiking, camping, avoiding sitting in public restrooms and many more uses. Though strong waste bags are available, keep in mind that they can leak or get pierced, which can result in a mess. This is especially true if you decide to use a regular trash bag...watch for leaks! If traveling with small children, be sure to choose a commode that takes their size and needs into consideration. For the toddlers, it is best to bring their own port-a-potty along. Privacy can be tricky in a more populated setting - we highly recommend investing in a privacy shelter, but if you choose to use your tent, be sure it is spacious enough where you can sit comfortably. 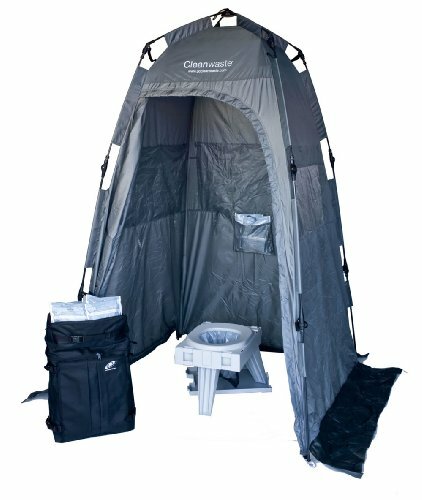 Depending on the type of trip you have planned, sometimes you might need a few different varieties of portable toilets/products to be the best prepared. Portable Toilets Just For Women!! So lets start by narrowing down your search. 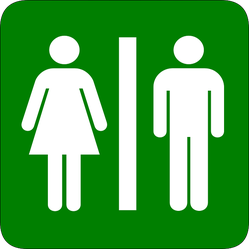 Review the summaries of the various styles below to assist you in finding the right type of toilet for your outing. Once you have chosen the correct style to suit your needs, you can just click on the link to take you to the appropriate segment. PORTABILITY is your primary goal. Your vehicle has limited space for all of your camping equipment. You plan to do a lot of hiking and driving "off the beaten path." You will have access to a trash receptacle (you won't need to store or haul waste bags). You plan to make a cathole pit toilet (these are great to set up over a pit toilet). You will have a level surface to place the toilet (most collapsible toilets have legs, not a flat base). EASE OF USE is your primary goal. Your vehicle is not limited on space for all of your camping gear. You prefer to leave the toilet in one place during your trip (your tent, rv, privacy shelter). You will need to haul your waste to a trash receptacle or outhouse. You want an affordable product that does not require purchasing a lot of "extras"
SIMILARITY TO A REGULAR TOILET is your primary goal. You like the idea of setting up a commode and then not having to worry about doing anything more such as dumping waste or bags, setting up bags before each use, etc. When full, someone will be able to lift the toilet without trouble. Maintaining and cleaning/disinfecting your investment after your trip is not bothersome to you. You are looking to add a toilet to your RV or camper without spending a fortune. Collapsible camping toilets are the perfect solution for portability. They fold down to a more manageable size than other rigid toilet models. If you plan to be on the move, they can easily store in the trunk of your vehicle or behind a back seat. They are a great addition to a pit toilet, if you will be in a remote outdoor environment. To be so portable, you will lose some conveniences found in other toilets. Though some models are taller than others, they don't tend to sit as high as the bucket or flush style toilets. Due to the leg design, vs. a flat base, they cannot be propped up to sit higher and can be unstable on uneven ground. The examples below are very highly rated for strength and durability. They all offer their own collection bag and waste kits (sold separately), though over time some thrifty campers find ways to use their own bags and products for economical purposes. Self-contained, bucket style toilets are the perfect solution if you are looking for something easy to use. You can use them with or without bags, though bags are recommended for an easier clean-up. Their flat-bottomed surface makes them sturdy, even on uneven ground. Made of plastic and being self-contained, there won't be any unwelcome surprises from a leaking bag. They tend to be taller and can be set up even higher on a safe, flat surface. Contents can be hauled with ease. Affordable and quick, this style is very popular with the outdoor enthusiast. We've used this style quite often, without bags, for liquids only. Collecting toilet paper in a separate bag makes dumping contents in an outhouse (or in the deep woods) a breeze. Easily rinse out with a little water and you're good to go. We spray with Lysol after each use and have found this very clean, odor free and simple. If you use bags, you will be limited in how much weight they can hold. Therefore, if you do not have a trash receptacle or outhouse to dump the contents, the bag will risk breaking with multiple use. Some people recommend putting cat litter at the bottom of the bag, to help absorption. The toilet is not collapsible, so be sure you have room for it among your other camping equipment. If having a toilet that functions like the one at home is what you are looking for, there is no question that this is the style of portable toilet you will want. You will not have to work with setting up bags, disposing of bags, etc. These are perfect in a stationary setting, like an RV, motorhome, tent or privacy shelter. They are an affordable solution to a pop up camper or smaller travel trailer that does not come equipped with a toilet. As long as they can fit into your vehicle, they are an excellent choice. They are sturdy and can also be placed on a safe, raised surface to accommodate those who have trouble with their knees. You will need to be prepared to lift the toilet, which can get quite heavy, at the end of your trip (unless you are in an area where you can empty it more frequently, to keep the weight down). In addition, be prepared to clean and disinfect your investment when you return home from your journey. Also, you will want to purchase a deodorizer that breaks down waste and toilet paper, so do plan on having to buy some "extras" to protect your investment! There are a few other items you might want to add to your supply list, when spending time outdoors without a restroom nearby. Disposable urinals and privacy tents are wonderful additions to any nature outing. Travel John's disposable urinal is perfect anytime, anywhere - as it can obviously be used for emergencies even if in an urban setting. They make them for adults and children, so bring them camping or just keep them in your car. A privacy shelter is such a great investment if you go camping. Not only can you put your portable camping toilet inside, you can also change clothes while standing up, which many small tents make nearly impossible. We certainly hope we have assisted you in finding the right camping toilet for your next outing, quickly and easily. We sincerely doubt that most people desire to spend a large part of planning their camping trip reviewing toilets. Choosing the right toilet for your temporary trip or permanent RV toilet (collapsible, bucket style or deluxe flushing toilet), as you can see, can take a lot of time and thought. Now just grab some hot dogs, S'mores ingredients and some roasting sticks and you are good to go! Whether you call it a spork or foon, this wide selection of sporks for sale will please everyone - whether the utensil is for camping, kids, a party or just for simple fun. Great frugal idea, Zubair...thanks for sharing! You can also line the bucket with a garbage bag so there isn't a mess. You can make these portable bucket toilets yourself. All it take is a hard 5 gallon bucket that is used in construction sites. Take a pool noodle or a pipe insulation. You will have to cut the pool noodle length wise. Put this on top of the bucket.